Nasr joined Williams ahead of the 2014 season, as the team found some investment from Brazilian sponsors. Felipe Nasr was confusingly brought in at the same time as Felipe Massa, but was signed as a reserve driver with testing and practice responsibilities. His first opportunity to drive the car on a Friday during the season came in Bahrain. With Williams opting to keep their driver lineup for 2015, Nasr moved to Sauber to make his F1 debut. Felipe Nasr started his motorsport career like many of the greats, karting in various different Brazilian championships and taking home several titles. He joined the Formula BMW Americas series for one race in 2008, taking part in the Grand Prix at Brazil. He switched to Formula BMW in Europe for 2009, participating in the full season and winning the title at his first attempt. The following year, Nasr joined the British Formula Three championship, driving for the Kimi Räikkönen owned team and signing with Kimi’s manager at the same time. He switched teams in 2011, moving to Carlin Motorsport, and winning the title by a substantial margin. GP2 was next on the agenda, where he spent two years at DAMS and then back at Carlin. The driver picked up several podium finishes, but didn’t quite get to the top step. Ahead of the 2014 season, Nasr was announced as reserve driver at the Williams F1 team, with confirmation that he would participate in several practice sessions throughout the year. His performance was praised by the team, but they didn't have a seat for him for the 2015 season. Instead, Nasr moved to Sauber to join Marcus Ericsson in an all-new lineup for the Sauber squad, and the team opted to keep the same drivers for 2016 as well. 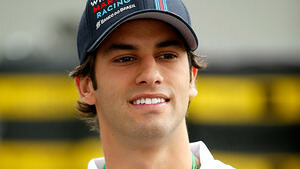 Learn more about Felipe Nasr with the Pocket F1 Handbook. 04/12/2016 Which drivers crushed the official paddock quiz this year? Daniel Ricciardo goes round the outside of Felipe Nasr at turn one, stealthily moving past the Sauber to take eighth place. Nico Hülkenberg is close behind Felipe Nasr now, the Force India looking to get past. No wonder Sauber look nervous. Sauber bods starting to look nervous as they are hoping Felipe Nasr can finish in this crucial 6th place, pick up their first point and earn them millions. That won't jinx it, will it? The Sauber of Felipe Nasr is causing a bit of a train now. Vettel has Alonso ahead of him, with the McLaren aiming to get past Nasr. Felipe Nasr is currently sitting in seventh, however, which would mean Sauber's first points of the year and if the race goes to the end, they would jump Manor in the championship. Felipe Nasr has come into the pit lane to take his first stop of the afternoon. He's swapped his supersofts for soft tyres. Felipe Nasr did make it past Bottas to move up to 14th. Button's team radio tells him to go for maximum-attack now, he's chasing the Sauber of Felipe Nasr.